This trowel is now in the collection of the Herbert Art Gallery and Museum, Coventry. 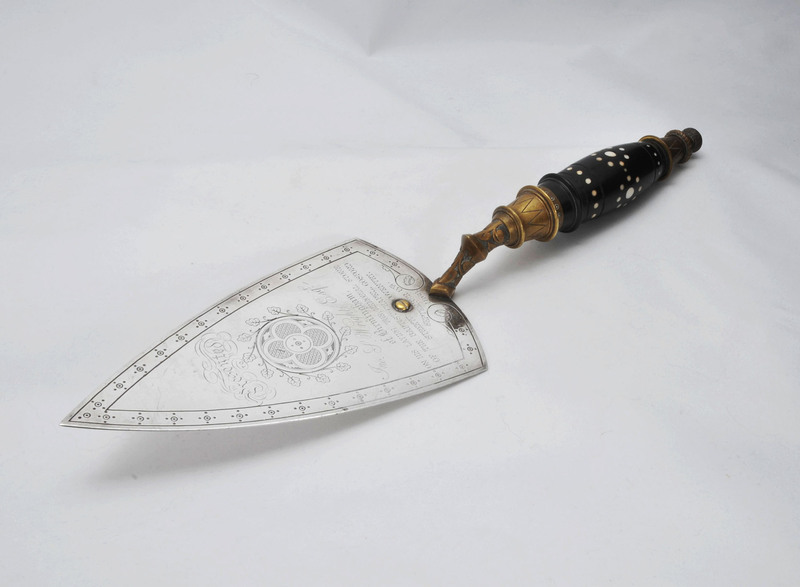 A rare Francis Skidmore gothic revival silver trowel with brass, ebony and ivory handle. Francis Skidmore was, in his day, comparable to John Hardman & Co. Skidmore, based in Coventry, is known for his work with George Gilbert Scott, including manufacturing the metalwork for the Albert Memorial and the Hereford Screen, now in the V & A. Skidmore’s silver work is very rare. This trowel is fully hallmaked for 1868 and carries an inscription for the openning of the Gosford Street Baptist Chapel in Coventry of that year. Bruce Talbert worked with Skidmore in the period 1862-68 and it is possible that he designed the trowel which carries gothic revival motifs in his style. For more on this trowel and its new home at Coventry’s Herbert Museum please click on this link.